Thuja Green Giant Trees are great for creating a privacy fence or making a property line. This privacy plant helps block out eye-sores, neighbors, street noise. Don't be fooled, this is the real Thuja Green Giant that grows up to 5 feet per year! The Thuja Green Giant is a hybrid cross between Thuja plicata and Thuja Standishii Arborvitae. If you want this plant for privacy we recommend spacing the trees 5 feet apart this will insure they grow together while maintaing a healthy habitat for the trees. For more planting information read our Thuja Green Giant planting spacing and planting instructions. The best time to plant Thuja Green Giants is during the spring but many zones can plant in the fall as well. 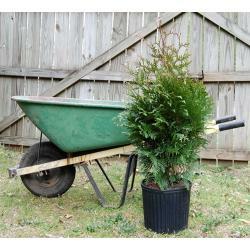 Hardiness is an important factor of any plant purchase; Thuja Green Giant are known for being very hardy plants. Currently shipping 2.5 - 4 feet (3 gallon pot) - 3 years old. **Can only ship UPS Ground/Fedex Ground/Home** These trees are excluded from any free shipping promotion and have to ship one of the methods listed above. ** Orders of 10 or more could require a quoted shipping price.